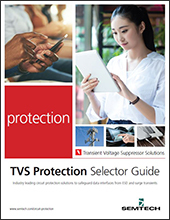 RailClamp® TVS arrays are ultra low capacitance ESD protection devices designed to protect high speed data interfaces. They are designed to replace 0201 size multilayer varistors (MLVs) in portable applications such as cell phones, notebook computers, and other portable electronics. This device offers desirable characteristics for board level protection including fast response time, low operating and clamping voltage, and no device degradation.